I have a decade of experience in the industry and it was my long-term wish to answer the query of my clients in the form of a post. I have been frequently asked about the "best bass traps" and it's 100% normal. Over the decade, I have recommended bass traps of different brands to my clients. Needless to mention, I also tried quite a few of them. Over a period of time, most of the manufacturer's have improved the quality of the bass traps and other related products. Technology has been the foundation of the innovation. Every client is different and has different sets of requirement. It's risky and monetary loss to experiment with clients. So, we buy a product and test it for a few months and afterward, we recommend it to the client. Coming back to the topic, we will be ONLY reviewing the products that have worked for us. Most of the information that we will share in the review section will be very helpful and informatics. Auralex Bass Traps are one of the well-known brands. They have multiple variants of the products. The product line consists of a wide variety of products designed and manufactured for specific needs. I have published a couple of posts earlier also on Bass traps and I am sharing the link for your perusal. As discussed in my earlier posts, it's definitely easy to handle mid and high range frequencies. Most of the time, handling low-frequencies is a tedious task. Most of the musicians I have come across are looking for a feasible way to tackle the notorious low frequencies. 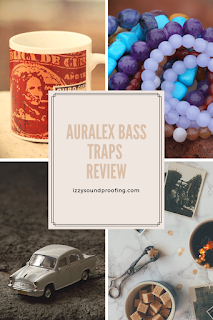 In this post, we will talk about the Auralex bass traps product line. If you are the one looking for the bass traps that can make the difference, then I can assure you that this post will definitely add some value and help you to come to a conclusion. When you are planning to go for acoustical treatment, the first thing you need to do is get your room evaluated by a professional. The benefit of it is that you can categorize your requirement in mid/high frequencies and low frequencies. The lower frequencies(LF) are NOT only complicated to deal with but also requires lots of time, energy, and money and the worst part is the final outcome may NOT be satisfactory if the bass traps aren't uniquely designed to tackle the low frequencies. Remember, placement of the traps in the room also plays a crucial role. Corner's of the rooms, especially the trihedral ones need to be handled carefully. Auralex has developed a wide range of product to deal with the low frequencies. They have bass traps, corner fillers, and acoustical panels to deal with the LF. The Auralex products come in different sizes and colors. Eric Smith is the man behind Auralex. He founded the company forty years ago with a mission to offer a better alternative to foam panels of that time. His goal was to offer the product to the masses by making it affordable as well as high quality. After doing some research on the company as well as the founder, I found out that his vision was to follow the consumer's need and try to give a solution to the consumer's problem by providing them the product which is affordable and effective in solving the problem. It didn't take much time to see the success. 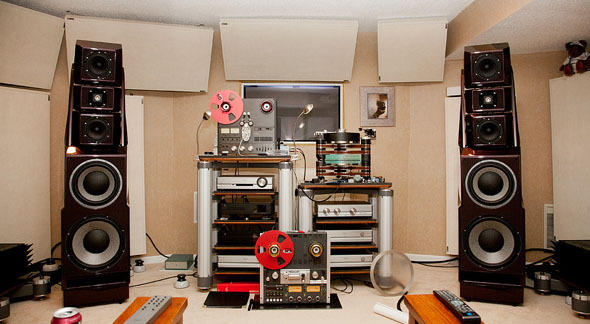 The first success came in the form of Studiofoam which later became the market leader in the acoustical product. As mentioned earlier also, they have a wide range of products, that is, room system, construction, and absorption products. 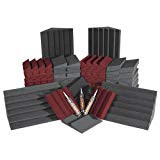 Bass traps and diffusers are the most popular ones. If you ask my point of view, then I like the portability and reconfiguration capabilities of the Auralex products. It gives me a free hand to configure the product as many times as I want. So, I can try different configuration to reach perfection or the ideal solution as per my need. Do Auralex Bass Trap Works? Trust me, it's one of the frequently asked questions and at the same time very difficult to answer. In a decade career in this domain, I have seen people spending thousands of dollars and in return getting just peanuts. So, finding the perfect solution isn't as easy as you think, even though you are ready to spend a lot. Remember to read the manuals and specification of the products even before you announce your judgment. It's very important to understand the setting up, working, and expected the performance of the product before you take any decision. By trying to understand these three steps, you will get an overview as well as a sound knowledge to take a call whether it suits your requirement or NOT. For example, the foam is an excellent solution to the acoustic problems but at the same time, it is not a good alternative for soundproofing. Since the bass products are easily available and affordable, people buy it and then think that it will dampen all the outside sound. Since the product isn't made for it and is not able to do so, it is marked as a non-performing product. When people didn't get their room or office evaluated by the professional, then they face a problem regarding the number of traps to be placed in the room. The question is very simple, "how many is too many?". For a small/mid-room, I recommend each corner of the room to have one bass traps and at the same time, if you have speakers in the room, then placing a bass trap at the back of the speaker will be of great help. If you have the budget, you can place the bass traps on the ceiling as well as the horizontal walls to improve the performance. But keep in mind that all these bass traps can help you in reducing the reverbs, echoes etc. It has nothing to do with the external noises. As the name suggests, bass traps are the solution to the low-frequencies problems. The reason I have mentioned the above statement is important because if you use the bass traps for low-frequencies, you will definitely see the result and at the same time, using it for other purposes will not give you any output. I recommend you to first apply the corner traps in every corner and then add some panels if needed. The first on the list is Auralex Acoustics LENRD and perhaps the most popular one. This bass trap is among the few to perform extremely well against the low frequency. They are extremely effective in absorbing the lower frequencies down to 63 Hz. The bass trap comes in a pack of four and three color variant- charcoal, burgundy, and purple. They perform extremely well in case you mount them between walls and the ceilings. At the same time, you can also mount it horizontally on the walls. Last but not least, it's definitely a budget-friendly and economical solution. In short, a value for money package. 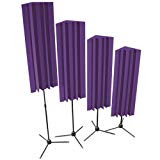 The stand mounted Auralex bass trap comes in a pack of four and two color variants. For my room, I prefer the burgundy color over purple.As the name suggests, this bass trap comes with a stand embedded in it. Depending upon your requirement, you can adjust the length of the stand. I love the fact that I don't have to worry about the problem related to mounting.Since this bass trap is stand mounted, so I don't have to worry about the adhesive and importantly no wall repair is needed once I decide to shift my home. The product is affordable, portable and great looking. 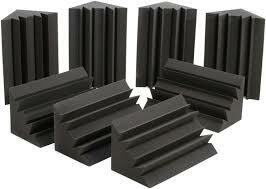 The Auralex Metro LENRDs Bass Traps are high-density, open-celled acoustical foams. The high-density foam helps to smooth out a room's overall bass response. The product is very effective against lower frequencies.It is partially formulated with soy components and that means a reduced use of chemical-based petroleums.The company claims that the high-density foam will NOT change its form over a period of time. The product comes in a pack of eight with three color variants- purple, burgundy, and charcoal.It yields a balanced listening environment by controlling the bass build up. The Auralex Roominator Kit is easy to install and a great option for a small studio. The class B fire rating makes it a great choice among the musician. If you are looking for a complete package for your home studio, then definitely this product should be on your list. It provides you with an end-to-end solution. It features bass traps as well as panels.The best thing I like about this product is that it improves the entire acoustic environment. It improves the sound of everything you record. It minimizes the effect of the sound bouncing back from the wall and other solid surfaces present in the room. As a result, you will hear the clear sound of the source while recording.I recommend this product to those who are looking for a home studio.The Auralex traps are lightweight, durable, long-lasting, and most importantly economical and budget friendly. You can mount these traps in the corner, wall, and ceilings. I am sharing with you the list of product that you can use for installing the Auralex bass traps. Why choose AURALEX Bass Trap? Even though you spend a lot of money, you can't be sure that you will get the best product. Trust me, "best product" is a relative term. A product can be best for a particular problem but at the same time, it can't be even good for the other problem. The first thing that I say to my client is to figure out the problem that you want to target. Later, we discuss the available solution and finally take a call on the one that is most effective and affordable. Made up of top quality acoustic foam. A well known and reputed brand. Highly effective if installed correctly. Best brand to handle low frequencies. Allow me to share with you the common misconception that my clients possess. Most of them believe that the costliest products are the best ones. Though it may be true in most of the cases still I recommend the product that is value for money. For example, a lot of people will NOT recommend you to use foam for the low frequency but if you do product research, you will find a lot of foam products that can perform well against low frequency. As I have discussed earlier also, you can definitely give the Auralex bass traps a try. Almost 95 percent and above clients have given a great feedback about this product. If you have installed this product, then please share your feedback, it will help our readers also. Don't forget to check the best soundproof curtains.